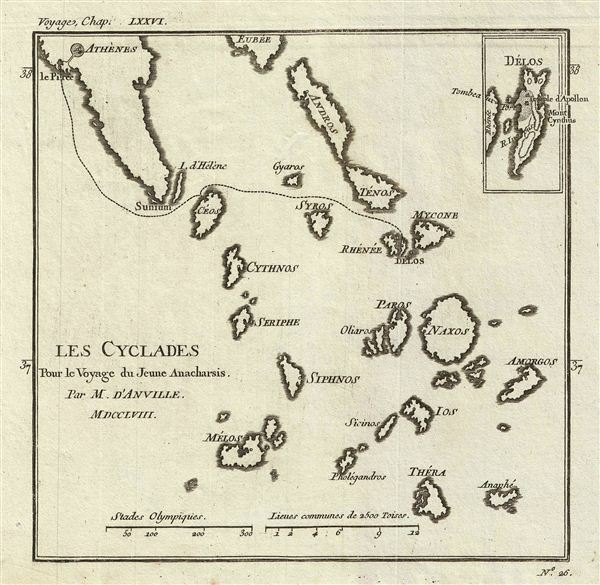 Les Cyclades Pour le Voyage du Jeune Anacharsis. This is a fascinating 1791 map of the Cyclades, the island group in the Aegean Sea, in Ancient Greece. The map covers Andros to Anafe. An inset in the upper right quadrant of the map details the island of Delos. According to Greek mythology the island is the birth place of Apollo and Artemis. Prepared by M. Barbie de Bocage in 1791 to illustrate the Travels of Anacharsis. Very good. Original platemark visible. Blank on verso. Dark clean impression.